When a LifeCoaching Relationship Considered Successful? When Is A Life Coaching Relationship Considered Successful? The only reason you engage a life coach is to achieve your coachable goals. The only reason a life coach coaches you is to make darn sure you DO achieve your coachable goals. A life coach’s job is to coach himself or herself out of a job. The lifecoaching process is all about you completing your goals on your terms, and on your agenda. What Is A Coachable goal? A coachable goal is a future place you want to be that requires you to grow and improve as a person to achieve it. You the client choose your future place. You might choose to become a far more successful and productive leader or manager. You might choose to discover and get your ideal income position so you can go to play every day and call it work. Some people call this figuring out what they really want to do that allows them to enjoy and prosper in their new position. You might choose to discover and get life balance where you enjoy and thrive in all three of your lives, your work life, your personal life and your family life simultaneously without guilt and without internal conflicts. You will be traveling from you present place in life to the future places in life that you choose, and with coaching you will reach your chosen future destinations. The LifeCoaching Process Is Like Flying An Airplane. A successful flight only occurs when you can safely walk away from your chosen destination. You pilot the airplane to fly from one place to your chosen (future) destination. You, the client will be the pilot of the coaching relationship. You the client (pilot) will have all of the controls to go wherever you want. Your coach will be your co-pilot and navigator, but will have NO controls. 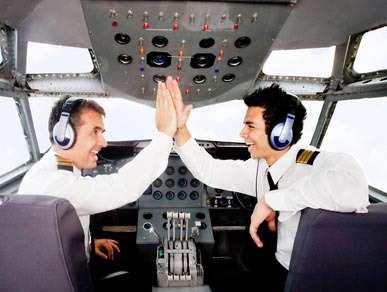 But, your co-pilot coach will make sure you successfully reach your chosen destination. The majority of energy in coaching is spent at the beginning and eventual completion of your goals. Just like the majority of the energy in flying is spent on take off and landing. With lifecoaching you do not look back. An airplane has no rear view mirror to look back. With lifecoaching you do not t go back. An airplane has no reverse. The lifecoaching relationship always takes you forward enough to maintain momentum to continue your successful journey. You must always fly the airplane forward over the minimum (Stalling) speed, to keep from stalling and crashing. The lifecoaching relationship is only considered to be successful when you accomplish your future based destination coachable goals. The airplane flight is deemed to be very successful when you safely land at your chosen destination. Getting Closer To Your Coachable Goals Does Not Designate Success. Just like getting closer to you chosen flight destination does not designate success. For example, if you choose to fly from New York to Honolulu, but the plane stops flying in route and lands at Kansas City, then your flight was not complete. Yes, you got closer, but the flight was not successful. You paid to land in Honolulu, not Kansas City. Likewise, if you only get closer to your coachable goals your coaching relationship was not successful. Just like your job as an airplane pilot is to fly all the way to and land safely at Honolulu, your life coach’s job is to coach you all the way to completing your coachable goals on your terms. You hire your life coach to reach your coachable goals and you pay for an airplane flight to actually reach your chosen destinations. Coming up short and settling for less in either flying or coaching is not in your best interest.